Gorgeous watercolour painting of a Springer Spaniel by a top British Ceramics artist and designer. A beautiful single pack on top-of-the-range Premium Quality 330gsm card – the best quality decorative twin pack available from us. Limited edition run of 500. Our Premium Quality playing cards have the most fantastic slip, snap and elasticity. We are pleased to continue our countryside theme of playing cards with this beautiful pack of Springer Spaniel playing cards. 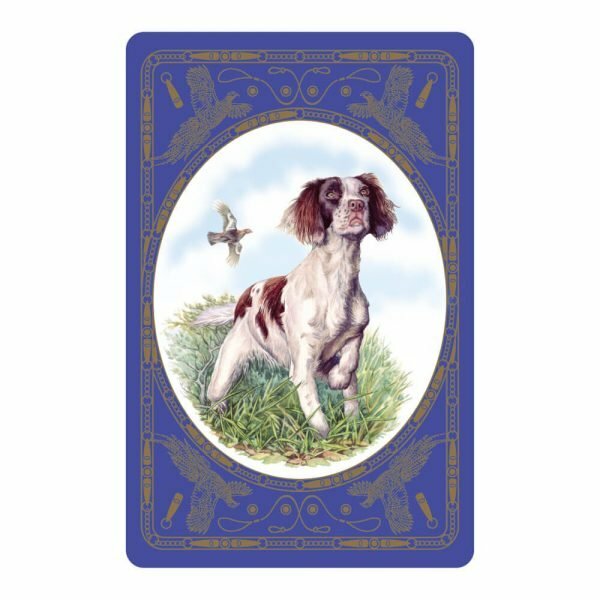 Featuring a gorgeous watercolour painting of a Springer Spaniel by a top British Ceramics artist and designer, this is one design in a range of Premium Quality decorative playing cards made from the best quality board. Black-lined for opaqueness, the beauty of the dense 330gsm board is that it has optimum flexibility. Finished with a special varnish for the most favourable slip and handling, these beautiful playing cards are durable and a delight to use, providing a top-quality cardplay experience. We really enjoy seeing the delight on customers faces when we hand them a pack to shuffle! Limited edition run of 500. Although bred to flush or ‘spring’ birds and other game for country sports, the English Springer Spaniel has become one of our best-loved breeds. Excitable and active, happy and fun, it’s a much-loved companion to many across the UK and is a great choice for families with children. Athletic and versatile, Springer Spaniels have been known to participate in agility, hunt tests, tracking, obedience trials and more, and he’s a great pal to have along when you go hiking or camping. Our Springer Spaniel playing cards show this wonderful dog in his natural habitat – off the leash and alert in the heart of the British countryside.